Come join us for installment #4 of Chilluminati’s reoccurring one night event! 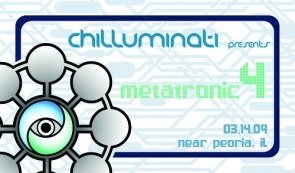 Prepare yourselves for a night of audio pleasure in 2 rooms, ranging from chill to progressive to psytrance, delivered by Chilluminati’s own. since 2001, and his project gained more shape and quality in 2004. Stereographic was one of the first producers of underground music in Brazil and in AMERICA. His music is played by a large number of respectable djs around the world. The style can be defined in 2 lines: Stereographic side a- full on night high-tech ,fat bass, deep atmospheres and melodies – and Stereographic side b – night, dark, harder sound, also with fat bass, efx and obscure atmospheres.It’s a combination of dancing and reflection. The event will take place at the historic Hub Ballroomwww.thehubballroom.comnear Peoria, IL. great country bands like The Confederate Railroad. HUB is famous for its legendary 5,500 sq. ft. floating Maplewood dance floor.